Traditional Chinese pork, easy to prepare and serve. Low food costs means this is a profitable dish. Place the pork on a sheet pan skin side down, cook for 20 mins at 375F. Combine the garlic, ginger, shallots, chiles, salt and Sichuan peppercorns to make the rub. Cover the pork with the rub. Loosely cover and allow to cool. Fully cover and allow to marinate in the refrigerator overnight (or at least 4 hours). Make the sauce by mixing the wine with the prepared Knorr® Professional Liquid Concentrated Chicken Flavor Base, honey, soy bean paste and black pepper. Remove pork from refrigerator and uncover. Pour the sauce over the pork. Cook uncovered for 30 minutes at 350F. Add the sweet potato to the pork. Cover and turn down the oven to 325F. Cook for another 40 minutes. Puree the sweet potatoes. Taste and adjust seasoning. Cool the sweet potatoes and pork, store separately. Reheat each portion of pork in the sauce. 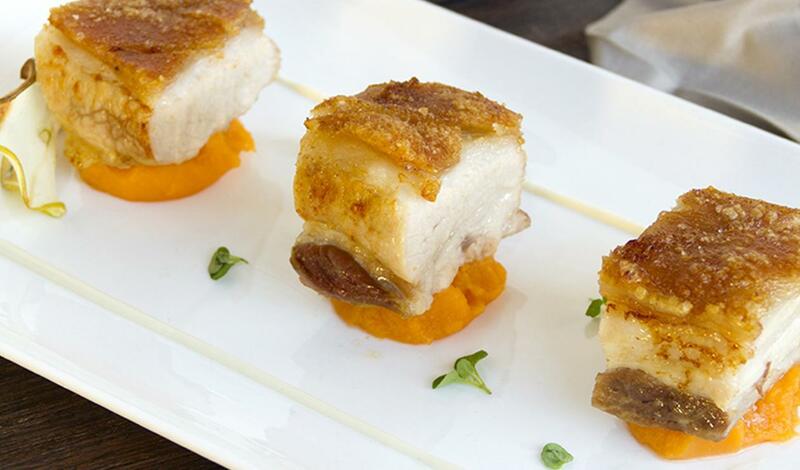 Cut each 6 oz portion of pork into 3 pieces.Place each 2 oz piece over warmed sweet potato puree.